Welcome to the Language & Vocabulary page. 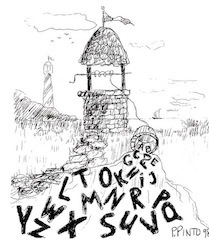 Here you can explore some of the non-English words I use in my poems, whether these words are part of my native culture or in some more easily recognizable foreign languages, like French, German, Italian, or Spanish. I love to include Abenaki words in my poems because the words in their original forms tend to convey deeper meaning than perhaps their translated-into-English forms do. 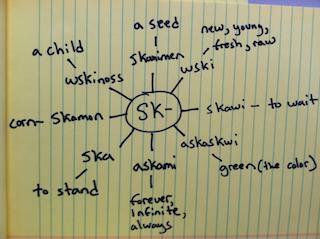 Abenaki words are, in general, made up of roots and add-ons such as prefixes and suffixes. These and other add-ons deepen the meaning of the roots or fine-tune the meanings. That is why so many of the words are so long. This page however is not meant to be a teaching page. I simply want you to see some of the words I have used in my poems. True also of foreign phrases and idioms I have incorporated into poems. I list a few favorites below. This list will continue to grow. Have fun, explore, try using certain foreign phrases on your own, share with me how this works for you. ASK questions in the contact me area. REMEMBER: You are not going for cultural appropriation here. You are simply adding depth to your poems. If you have questions, ask a translator or a native speaker of whatever language you are using. NOTE: Please do not try to use the Abenaki phrases in your own poems, as you will not have the context of culture in which to make them accurate or appropriate. You will also not have the correct suffixes or prefixes to denote the details added to the root words. The phrases shared below are only for your deeper understanding of poems by Abenaki poets, my poems included. Kaamoji! ... oh wow! for crying out loud!